Stress and thyroid disease have also been postulated to be causes of melasma. Melasma and deep hyper-pigmentation unresponsive to traditional medical treatments is not uncommon. Until recently there was no viable treatment option for those affected with this condition. 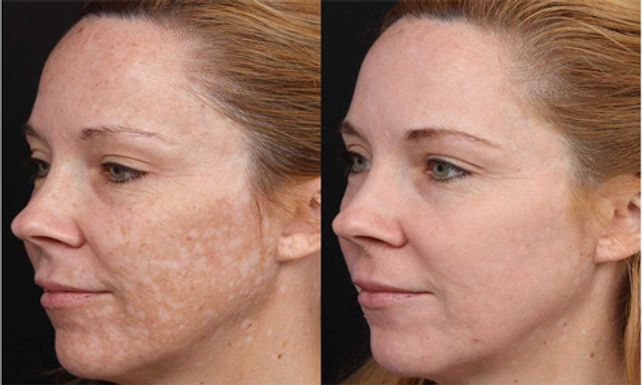 In clinical studies, PRP (platelet Rich Plasma) injections into the skin for melasma and other deep pigment disorders have shown up to 90% reduction in pigmentation after a series of three treatments. Excellent results with PRP dermal injections have been seen on people with melasma and hyper-pigmentation resistant to traditional treatments. PRP is a product of your blood, it is natural, free of side effects and has the additional advantages of improving skin texture, wrinkles, scars and firmness. Each treatment session takes between 30 to 45 minutes, without any downtime and the best of it is that it can be done even in summer. We recommend starting with three treatments 4-6 weeks apart. Some individuals may need additional treatments and some may be satisfied with the results of one treatment. PRP treatments are done at Dermatec Med Aesthetic Clinic by certified and trained medical doctors. Normal price is 350 euro per treatment, but we always have on going discounts. Interested persons are kindly requested to fill in the application form below and we will get in touch to schedule a consultation.